Anna Maria Hussey, née Reed, (1805 -- 1853) was a British mycologist who singularly wrote and illustrated the beautiful volume titled Illustrations of British Mycology (1855). Her lifelong dedication to the study of fungi had its roots in childhood, when she developed a keen interest in botany and art. Her scientific pursuits were further supported in her marriage to the Reverend Thomas Hussey, who came from a family with a long tradition of scientific involvement, and himself pursued astronomy. 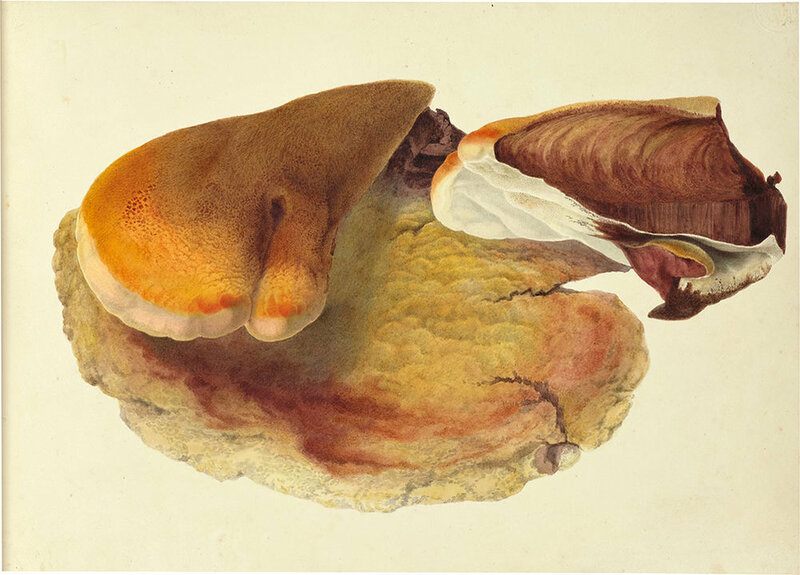 The illustration above is of the stinkhorn (Phallus impudicus), captured in her style of realistically-rendered color and a keen eye for the detailed reproduction of texture. Note, for example, the subtle shadowing on the head and stem of the specimen. 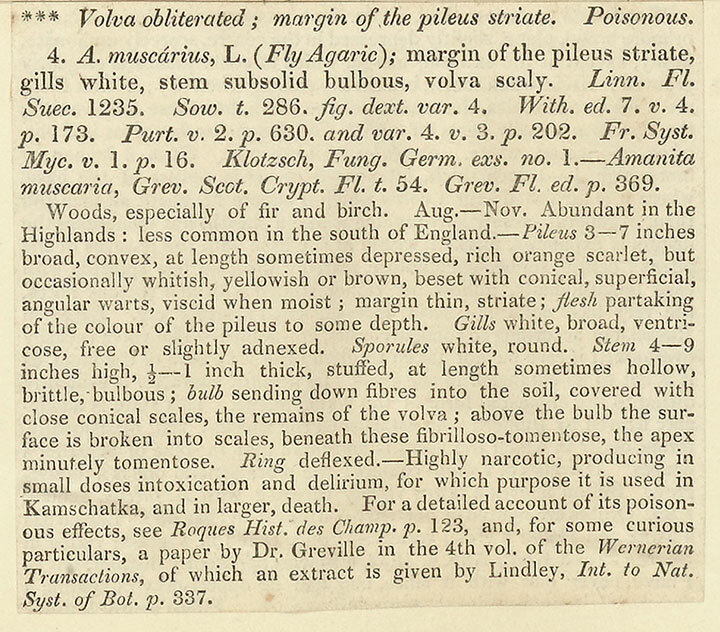 As with her other illustrations, the specimen is shown in its natural habitat, featuring other plants and insects that help provide scale and context. Hussey here gives equal care to the lifelike illustration of the ripe juicy fruit and thorny vines of the blackberry, as well as the fly casually perched atop the stinkhorn. Hussey was a woman truly ahead of her time. Her pioneering character and ambition shines from every page of Illustrations of British Mycology, which consists of 140 beautiful and detailed hand-colored lithographic plates published in two volumes. In this illustration of Agaricus muscarius, Hussey deftly presents all its key anatomical features yet simultaneously situates authentically the specimen in its natural environs, surrounded by grass and a background of rolling hills. Again, the lifelike texture characteristic of Hussey’s illustrations is skillfully displayed. Hussey’s art in Illustrations of British Mycology were accompanied by a wealth of information and an extensive commentary written in a frank, personable, and delightful style. She wrote in freely flowing, subjective, and rich language that set her text apart from the technical field guides popular in those times. She shared anecdotes and her opinions on topics ranging from romance novels (arguing for a passion for nature rather than an addiction to popular romantic fiction) to the utility of puffballs (best enjoyed in a puffball omelette, recipe accompanying). She even incorporated moral education in preaching against the unwise aversion to dirt (and, of course, fungi) with which young Victorian girls were indoctrinated. Hussey demonstrated a deeply sensitive reading of her readership -- upper-class women set primarily in the domestic sphere -- and subsequently adopted the best approach to drawing these potential fungi enthusiasts into the pursuit of mycology. Hussey’s text is unique in marrying scientific positivism, a typically masculine field, with more conventionally feminine domestic concerns such as cooking and child-rearing. Evidently, she was adept at juggling the duties of being the wife of a cleric and mother of six, with her personal passion for mycology. Hussey tussled her whole life with Victorian understandings of decorum and the woman’s proper place. She was a true feminist of her time, a Victorian “wonder-woman” artfully balancing personal responsibilities in the household with her professional aspirations as a mycologist, and extending these insights to her peers via publication. The fungi Husseia (now Calostoma) was named in her honor by Berkeley.